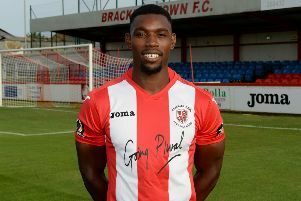 Brackley Town made it three wins on the spin in Vanarama National League North on Saturday. Saints returned from Darlington with as 3-0 victory thanks to goals from Andy Brown, Aaron Williams who extended his scoring record to eight successive league and FA Cup games, and Ellis Myles. Kevin Wilkin’s side put in a fine all-round performance and fully deserved their comprehensive victory. Immediately on the front foot, Saints took the game to Darlington who were under new manager Tommy Wright for a first home game and were ahead in the 19th minute with a goal fashioned by Adam Walker. Winning the ball on the left, Walker had the composure to pick out Brown with a perfect cross and his stooping header found the net as reward for Saints’ early dominance. Shane Byrne’s 25 yard shot swerved wide at the last, Jack Byrne’s effort was deflected for a corner and Brown missed a fine chance to double the lead shooting wide after an exquisite move involving Shane Byrne and Glenn Walker. But Saints went into at the break with a two-goal lead courtesy of another goal by Williams in the 42nd minute. Shane Byrne drove through the middle to confront the advancing keeper Adam Bartlett before unselfishly playing in Williams who swept the ball home. Saints opened the second period with a breathtaking move. Glenn Walker’s cross found Williams who smashed his volley onto the bar from 15 yards. Next it was Brown’s turn to be foiled by the woodwork, his header tipped onto the bar by Bartlett after good inter-play by Connor Franklin and Glenn Walker. Brown also saw his header saved by the keeper at point-blank range from another pin-point cross by Walker. Saints had some solid defending to undertake as the home supporters got behind their side but Danny Lewis was rarely threatened and largely enjoyed an untroubled afternoon. Saints sealed the win in the 80th minute through Myles. Walker danced around the full-back and took his time to pick out Myles who shot first time, his low effort finding the net off the post. The final score-line did not flatter the visitors. Indeed it was a comprehensive away victory that moved Saints into third spot in style.